This is reposted from GRIID.org. OKT will be tabling at the celebration. For the third year in a row, the Grand Rapids branch of the IWW (Industrial Workers of the World) will host its May Day celebration at Martin Luther King Park. 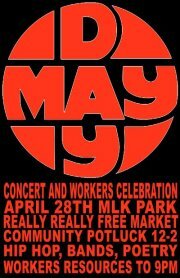 The celebration is a commemoration of the historic event known as the Haymarket Affair, which took place in 1886 in Chicago where the state engaged a brutal labor suppression that led to the execution of several labor organizers. The May Day Celebration is also a way that working people celebrate their power as workers, build mutual aid between each other and resist the capitalist class, which will stop at nothing to expand their profits at workers expense. This years’ event will include numerous information tables, a Really, Really Free Market, children’s activities, a community potluck and local live music from noon until 9pm. For a listing of the bands, check out the facebook event page. There will also be several people from the community speaking on a variety of justice issues between bands and several poets.